Irish Whiskey Society Forum • View topic - Tullamore Dew Distillery Launch Event. Tullamore Dew Distillery Launch Event. Great news about the forthcoming official opening of the new Tullamore Distillery in mid-September. Can the Committee tell us please who the three members will be to represent the Society at the event? Hopefully they can; for whatever reason it has been like a graveyard around here in terms of communication and updates for the last couple of months! Re: Tullamore Dew Distillery Launch Event. John, I can only presume that if there's three tickets available we (IWS) should be represented by our elected members .. President, Vice President, Treasurer ??? But I see this morning that there is a trip planned for members in 2015. Not sure if its for "Irish" or "American" members though? On the current bookings page for the U.S. tasting there is the following comment. "We will also preview the new Tullamore Distillery before the Society’s visit to Tullamore in 2015 with Distillery Ambassador Jane Maher"
Well with only three tickets it might actually come down to that. A bit more communication and transparency would be expected though. Someimes it feels like the only way members learn anything meaningful about what's happening within the Society is at the AGM! John wrote: Well with only three tickets it might actually come down to that. A bit more communication and transparency would be expected though. Someimes it feels like the only way members learn anything meaningful about what's happening within the Society is at the AGM! You should send a message to the committee, I will too. I don't think any committee members are using the forum. I know most of the committee and don't see any posts from them in months . I was on the committee a couple of years ago and know that they used to post minutes in the committee section of the forum. This hasn't happened for a long time, as they have a group email systeme and don't need to use the forum. I think some items should be discussed with regular members. I know that an email was sent recently to members regarding Whiskey Live but that all. Apologies for not answering this earlier. Thank you for your feedback. We appreciate the views and opinions of all our members.We update the website with the latest news and we send newsletters to our members via email all the time. We also deal with email queries. Going forward one of the committee goals will be to become more active on the forum and also improve on our website, newsletters, facebook, twitter etc. You can also approach anyone of the committee at the tastings with your opinions.The society was set up by our members for our members. 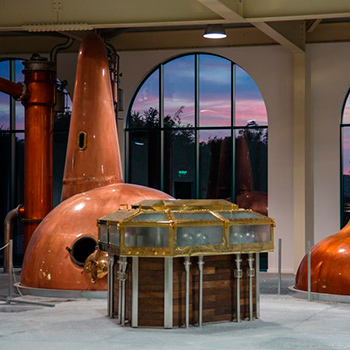 It is great news that the Tullamore distillery will open on the 17th September. The three committee members attending the opening are Peter, Sarah and Ken. We will post all information regarding the opening day on the website as soon as possible after the event. 1. On the 2nd October the distillery ambassador Jane Maher and the USA brand ambassador Tim Herlihy will talk us through the continued growth of Irish whiskey in the key USA market and the plans for the new distillery. They will answer any questions you may have. They will also present a tasting of their favourite whiskies, new,old, rare and some surprises. Hopefully you can all attend on the night. 2. A trip to the distillery in 2015 for our members. The numbers will be limited. It will be a first come first serve basis , so therefore early booking will be important. We will let our members know exactly when the visit will happen as soon as we have all details confirmed. If anyone needs some further info., please let us know by this forum and we will do our best to answer as soon as possible. Thanks to Sarah, Ken & Peter for representing the Society, I look forward to updates on here and facebook. There are updates on the latest news section of the website too. A write-up is available in 'The Journal' today on the opening of Tullamore Distillery. Tullamore native Ken Quinn here. Would just like to thank the committee and the members for giving me the honour of representing the society at the opening of the Tullamore D.E.W. distillery today. There is great excitement in the town . I met many old friends and made many new friends. We are all so proud to see Tullamore D.E.W. come back to its home after 60 years. Thanks to all involved with today - Grants, John Quinn, Jane Maher, all the Tullamore D.E.W. staff to name a few. I am sure you are all as proud of the new distillery as we are. Its a great achievement. Thanks Peter and Sarah for travelling down. Great to have you there. The three of us opened the miniature Tullamore D.E.W. Phoenix 2014 celebratory limited addition that was given to us and toasted the new distillery along with Hedei from the whiskey trail. (Was never great at spelling, so apologies Hedei if I got that wrong, I`m a numbers man!!!) We were probably the first and only ones who opened it on the day. It was excellent !!!! Hope to get some of this for our members to enjoy soon. It was disappointing that more of our members could not attend, but there was huge interest in the opening and therefore the distillery had only limited numbers of tickets available on the day. As mentioned previously in the forum though the distillery is coming to us in Dublin in the form of Jane Maher distillery ambassador on the 2nd Oct and a visit to it is on the cards for 2015. I hope you can all join us! We hope to have some photos on facebook and update the news etc on the website soon. Sarah was active on twitter today also. Thanks for the report. The Facebook link is here. Thanks to Sarah,Peter and yourself for representing! I'd love to have got to that one too. The stills were amazing alright. I am told that they were designed in line with the stills of the old distillery. Excellent guys, thanks for all the info. A photo attached I received today from John Quinn, Global brand ambassador for Tullamore D.E.W. I`d say some of you may already know him. He has been at a number of society events before. He has worked hard for many years to rebuild the Tullamore D.E.W. brand and is a good friend of the society. His name is now on a new limited addition bottling to celebrate the opening of the distillery. It was released at the opening of the distillery and will be available in limited numbers in select stores. I can now confirm we will have samples for our members at the Tullamore D.E.W. event in Dublin on the 2nd Oct.
Won`t say any more about it, as we would like it to be a surprise on the night. But if you are curious and can`t wait there is some info. online on it. There is photos of the opening day of the distillery on http://www.offalyhistory.com if anyone's interested. Also a great source for info. On the old distillery and the history of distilling in the town. Just noticed the photo on the main page dated Nov-01. Was there a Society visit to the new Tullamore Distillery at the start of this month? If so, could one of the attendees provide a write-up for members on the visit? Apologies for the delay in answering. I was out of the country. The distillery issued an invite to the committee on this occasion. We did ask them to open it up to the members, but it was not possible this time round. The visit for the members will definately happen in 2015. It has been agreed with them. The distillery is not open to the public. The members will be some of the few that will get to see it. Numbers will be small also, as it is a working distillery. The committee will inform all members closer to the time. Early booking will be important. By the way, as the year comes to a close I would like to personally thank all at Tullamore D.E.W. for hosting the events this year. It was a busy year for all there. I would also like to thank all the committee and the members. See you all in 2015!! The trip to Tullamore and Kilbeggan is up on the website.